Give your promotion maximum impact with our range of stylish and eye-catching indoor motorised banners. 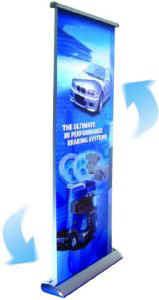 What are interchangeable cassette roller banner stands? 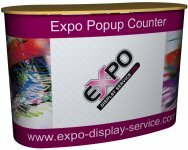 Scrolling banner systems are a popular alternative to static banner stands. Because they are in constant motion, they are even more attractive - whilst remaining highly portable. The continuous graphic loops continuously to get your message across as effectively as possible. Motorised hanging, floor standing and wall mounted versions are available. The Maverick indoor scrolling motorised banner stand is ideal for indoor use at exhibitions and in reception areas. This floor-standing display with a sleek silver anodised base is highly portable and is supplied co>mplete with carry bag. 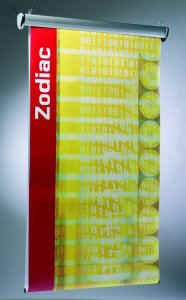 The Zodiac indoor scrolling motorised banner stand can be used either as a freestanding display, suspended from a ceiling or mounted to a wall. Once in motion the Zodiac is the perfect way to achieve maximum exposure for your message.